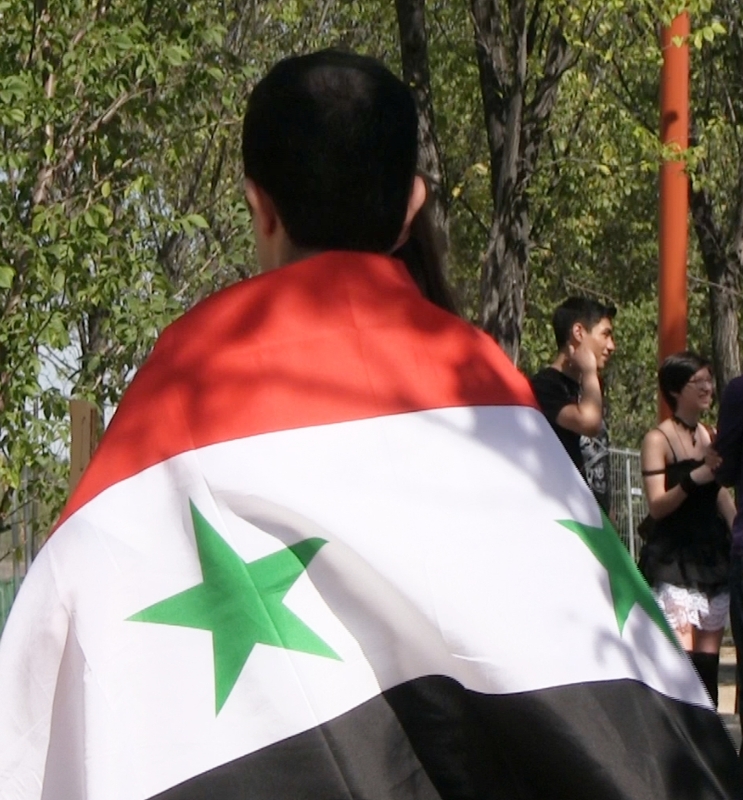 About 50 Winnipeggers rallied at the Canadian Museum of Human Rights Saturday afternoon to express their opposition to foreign military interventions in Syria. The rally, organized by Winnipeg Alternative Media, was one of many held on Saturday across Canada, and was part of an international campaign to prevent the Syrian crisis from escalating into a world war. In this video report, organizers explain what is at stake. What do you think are the implications of a media organization organizing rallies? Does it not undermine their position as an observer of society, and shift their role as media into a more propagandist role? You are quite right to question the objectivity of such an organization. That said, which is worse, an activist media outlet that declares its bias, or news organizations that pretend to be objective but who twist, manipulate or suppress information every day? Not being a member of WAM, I wouldn’t presume to speak for them. Perhaps you should ask them how they view their role as a media organization. I just think there is such a strong need for independent media in this country and that the tendency to fall back on polemics and activist positions is so strong. But I feel that counter-propaganda still continues to lose or fails to draw in people, the majority, who are not engaged in an issue. Creative media could really speak to people on the citizen-to-citizen level. I think Democracy Now walks the line more finely. We need media to clear and create the space clogged up by the rightly aforementioned mainstream media who twist agendas into fake objectivity, and maybe there is no neutrality, but a truly humanist media would include in its stance the complexity of it all, rather than assume a counter-solution. I think Fisk does a great job relaying the tragedy of a certain kind of politics without presuming to have a solution. I am not hearing any substantive critique of Axworthy’s Canadian/UN Responsibility to Protect -http://en.wikipedia.org/wiki/Responsibility_to_protect – and the strategy any of the people at this rally would propose if there were clear evidence that the Syrian Government was engaging in chemical warfare with its people. I agree the middle east is a powder keg and an attack on Syria could draw in Iran, Israel and Russia, leading to World War Z, but then should not some military powers have intervened 2 years ago to stop all the killing that since has happened? I counsel reading Fisk regularly: http://www.independent.co.uk/biography/robert-fisk – he suggests the moral atrocity of what has happened in Syria should have moved intervention 2 years ago. Saw a press conference with the UN spokesman today reporting on the investigators having left the country. One question asked why the mandate was not bring expanded by the secretary general, to assign responsibility for the chemical attacks. The spokesman reminded the journalist that the UN mandates come from the member states, not the secretary general. So how on Earth, is the question, can a neutral humanitarian army be formed that will be mighty and be able to intervene to stop civil wars from happening? It seems the UN is made up of too many competing (vested) interests. Maybe the UN reps should not be state representatives but come from the civil society of each country, giving the people a veto over their own government’s foreign policy when that policy involved international treaties, weapons trading, wars and the like. Well said, olamin! The Real News Network (http://therealnews.com) is another example of media which is both professional in its approach and challenging to the status quo. I was happy to receive an invitation to this rally at The CMHR this past Saturday. There appeared an announcement in the Saturday Winnipeg Free Press inviting the public attention to this event you held but I have not found anything (hard copy or on-line edition) any further. It is necessary that people take issues to heart and this one is no exception. I wish you good luck and I trust you will never be discouraged.